This center is located at 8313 West F Street, in an old brick school building that was relocated to this 65-acre site to provide a place for learning more about the Poudre River and its resources. Visit our Interactive Google Map page for a clickable map with details of the entire trail. From Greeley, head North on 83rd Avenue. 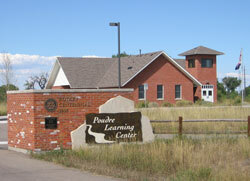 The Poudre River Learning Center is at the Northwest corner of the intersection of County Road 62 and 83rd Avenue. 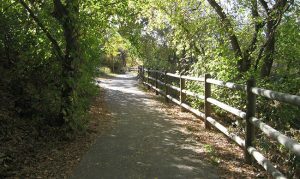 The Poudre River Trail runs along South of the center. There is parking and a restroom available. About 1/4 mile to the East of the Poudre Learning Center the trail narrows a bit as it follows the base of the Signature Bluffs. This is an exceptionally pretty section of the trail.